Following on from the previous show, Richard reports on a highly bizarre 1993 film featuring Credo Mutwa. 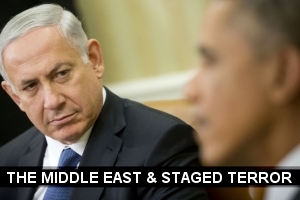 In the main part of the show we discuss the power politics of the Middle East. We often hear news commentators talking about "civil war in Syria" and how we can't just sit back and watch innocent civilians being killed. This is a very simplistic and ill informed view of the situation in Syria. The question which needs to be addressed is: what is the true cause of the conflict in Syria? Fabricated terrorism, as our guest explains is one of the tools of state-craft. By looking back at the plethora of fabricated terrorism incidents throughout conflicts in history it should teach us that what is reported by media can never be trusted. The BBC is probably the worst offender when it comes to spinning lies about international conflicts. As they say, truth is the first victim of war.